With its open-concept design and clean aesthetic, the large size contemporary computer desk from Modrine which is 54.8" length offers a spacious and efficient workplace for your home or office. 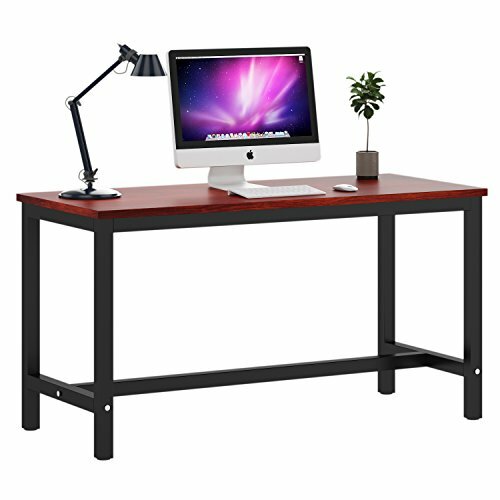 The metal frame and track-style legs ensure robust stability, sturdy enough to support an all-in-one computer, while the scratch- resistant particle wood protects the desk's surface from daily wear and tear.With the large size, it is perfect to use as a computer desk, office workstation,study table, meeting desk, working desk, home desk even dining table, etc.Personalize your home office with this functional desk.A rich glossy finish provides a simple, elegant and timeless appearance for using. ★[Material]: Panel material of Modrine large computer desk is environmental E1 standard particle wood with high glossy finish, waterproof and anti scratch.Desktop used melamine stickers which is now the most commonly used sticker for panel furniture. ★[Large Size Office Desk]: 54.8"(L) x 23.4"(W) x 29.6"(H)/ 48.5lbs weight & 280lbs capacity.54.8" long provides ample desktop space for computer, monitor or printer etc;provides large working space. ★[High Stability Desk]: With metal legs and adjustable leg pads, made the desks keep stable even on uneven floor.Extra steel support bar to connect the legs enhance load bearing & prevent shaking,or if you don't need it, you can also remove it freely.1.97" thick steel leg & 0.98" thick board ensures more stability and durability. ★[Easy To Assemble]: just need to install the 4 legs, 2 leg bars and 1 extra steel support bar with hex key (less than 15 minutes),which will save your valuable time (tips: make sure when you're putting the legs together the whole matches on top they have to be facing each other). ★[Multifunction Computer Table]: With the large size, it is perfect to use as a computer desk, office workstation, study table, meeting desk, working desk, home desk even dining table, etc.Personalize your home office with this functional desk.